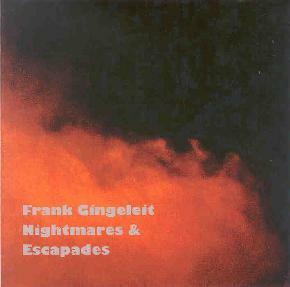 Frank Gingeleit - "Nightmares & Escapades"
We get a lot of electronic music submitted for review at Aural Innovations. Most of it is decent though ultimately unexciting as it falls too neatly into a mold that fails to distinguish it from the rest or even stamp it with some semblance of its own identify. Based in Mannheim, Germany, journalist Frank Gingeleit has created a set of electronic pieces that challenge the listener with its busy marriage of contrasting and image inducing sounds. Frank wants to be clear that his is electronic music that dispenses with loops, samples and computer processing, relying solely on guitar, guitar synthesizer, effects, and analogous 8-track mixer connected with a digital recorder. Analogies are difficult though perhaps a somewhat more experimental version of Ash Ra Tempel with doses of early 70's German electronica would give an idea of what Frank's music is about. The CD opens with the title track which consists of beautiful floating and trippy sounds that have a cosmically caressing effect, but are joined by clanging percussion that gives an avant-garde edge to the otherwise lulling space music. I like the combination. Frank brings together contrasting elements that work together well while still challenging the listeners senses. "Everest!... And Then?" and "Going Native" are the best showcases of the importance of percussion to Frank's work. The former is another successful blend of contrasts with its busy combination of tribal percussion, layers of drones, and rising and falling alien waves of sound. And percussion dominates on the aptly titled "Going Native" which conjured up images of uninhibited dancing around the campfire. It blew me away when Frank told me that all the percussion was done with the guitar and guitar synth because much of it sounds real. The jazz element is subtle on "Abstract Jazz" and there's even a rock element to the music. Kind of a bubbling space electronic jam. "Fractals" is one of the more purely rock oriented tracks on the album, complete with rhythmic foundation and freakiness galore. And for pure floating but intense space, "Go Space, Young Man", "X-tra-Terrestial Language Studies", and "The Industrialization Of Mars" are standouts. "Go Space, Young Man features floating space electronica with heavy rock drumming that propels it yet never sways it from it's slow mind-expanding path. It's very.... musical... and I could envision vocals working nicely with this track. "X-tra-Terrestial Language Studies" includes more floating space electronics, but with multiple layers of sounds and textures that will give the discerning listener plenty to wrap their ears and mantra around. I love the blend of freaky alien sounds and Tangerine Dreamy stylings. Finally, "The Industrialization Of Mars" is another title that fits the music perfectly as not only does it have an industrial feel, but its cinematic quality suggests that The Industrialization Of Mars would make a great film title. In summary, if you crave electronic music that demands your attention with its elusive complexity then you'll want to check out Nightmares & Escapades. There's too much going on to catch it all in one spin, as the music reveals more of its treasures with repeated listens. For more information you can visit Frank Gingeleit's web site at: http://www.beepworld.de/members38/frankgingeleit/. Nightmares & Escapades is also available from Aural Innovations. CLICK HERE to visit our mail order catalog.